The waterfront in the harbour of Halifax, Nova Scotia is the ideal place to enjoy a meal at any of the variety of restaurants. The wharves span the waterfront in the Halifax harbour in Nova Scotia, Canada where buildings are filled with a variety of restaurants. The scenery around the waterfront is beautiful and sitting outside on a warm summer day on the terraces at the restaurants is very relaxing while enjoying lunch or dinner. The water makes slow rippling sounds under the wooden wharves as boats arrive and depart from the Halifax harbour on a daily basis. 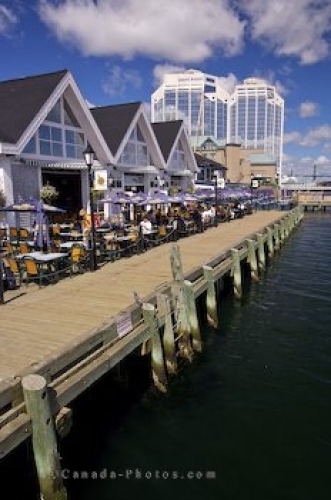 Picture of the waterfront restaurants overlooking the Halifax harbour in Nova Scotia.